Released in the US in September, the second-generation Motorola Moto X brought many improvements over the original model, including in the camera department. The new Moto X features a 13 MP rear camera that can shoot 4K (3840 x 2160 pixels) video. When we reviewed the Moto X, we found that its video recording capabilities were quite good. Now, Motorola is showing us what can be done when a Moto X, a drone, and a professional drone operator come together. 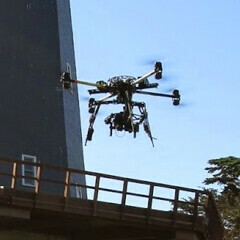 The Moto X was attached to the drone, which took the handset over San Francisco to capture some aerial footage of the area. The resulting video is certainly pretty cool, but we assume that other smartphones capable of shooting in 4K would have provided comparable, if not better results in the same scenario. A few weeks back, Samsung also used a drone to record 4K video with its Galaxy Note 4.
nexus 6 is my favorite version of the Moto X /s. I wish I could have purchased the Nexus 6. Buying it straight out and no upgrade was terrible....However.... I was able to get the Moto X Pure Edition on that Cyber Monday deal. It's a fantastic phone! I'd imagine that they'll update the 2014 models first, and they haven't updated Tue Droid Turbo. I'd imagine last year's Moto X will get an update by late January/ early February.